You’ve probably noticed that I don’t often ‘do’ pastels, but I might just give these a try. Stylecraft have introduced four new colours. Working out from the centre the colours are: Cornish Blue, Powder Pink, Spearmint and Toy. They certainly fit well into the range, and I’m thinking about a colour scheme using one or more. I’ll tell you more about that another day, but I wanted to remind you that Deramores have 10% off until the end of the month using DERAS10. Yes, it’s May, and a new section of the temperature blanket to be started. I wonder what surprises that will bring? 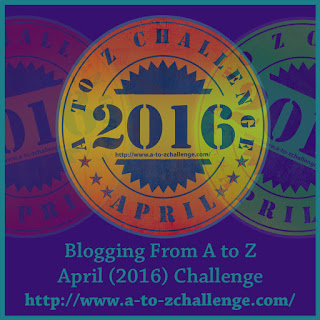 April is finished apart from the final joining. Finally this combination is finished! It’s been a bit confusing for me as I worked out of sequence so it’s good to be back on track. This Spirit blanket is going to be large! I still have masses of squares to do as the last several days have introduced new temperatures on a daily basis. The construction will go well into May so That month’s blanket will be considered at a later date. These are just a few of the temperature squares for April. They aren’t in order, but the blanket itself is on track. Only one more full day to go for this month – will it bring more colours? 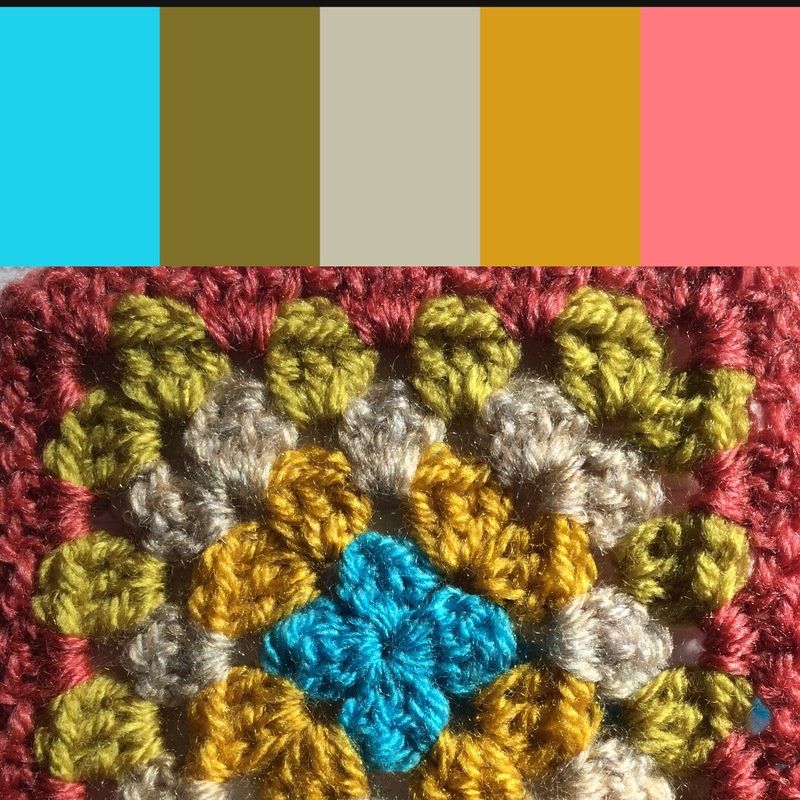 Don’t forget to look at yesterday’s post for this month’s Five Colour combination. 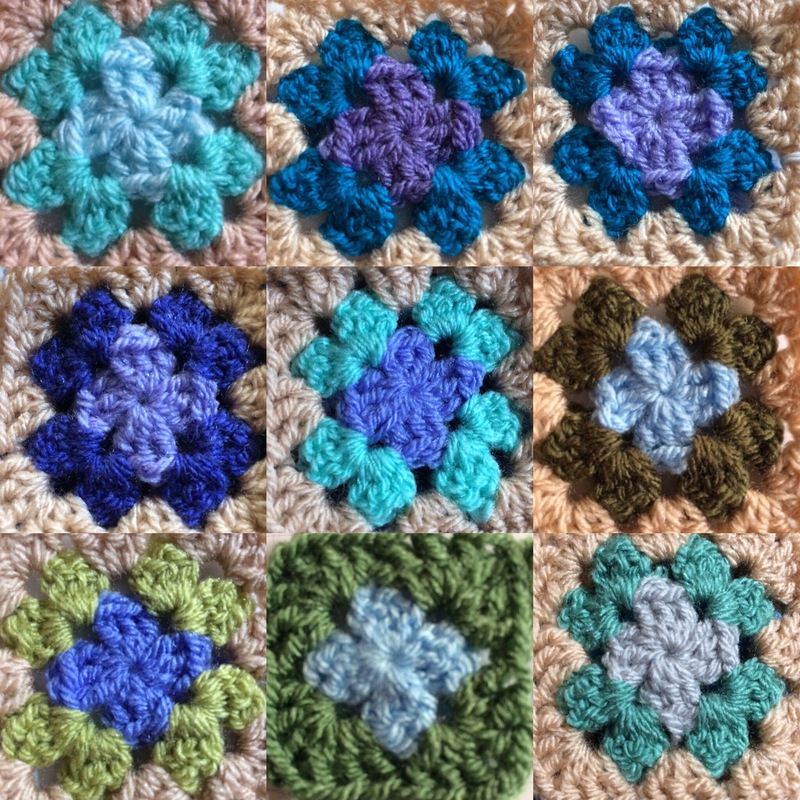 Author nuvofeltPosted on April 29, 2017 Categories Blanket, crochet, Spirit of ...., Temperature BlanketTags April, postaday, Spirit of April, spring1 Comment on At last! 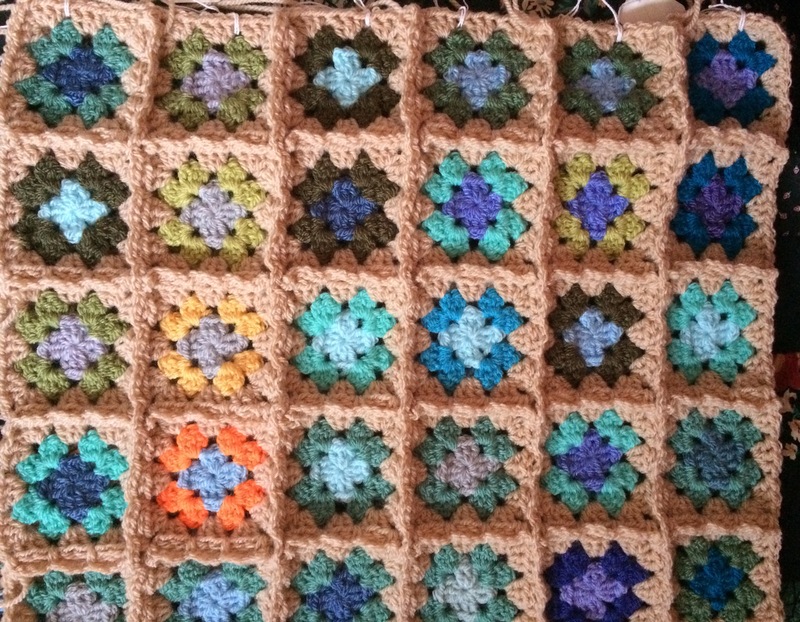 This granny square is a mix of yarns. I’ve chosen some by Cygnet and a few from Scheepjes. All are double knitting. If you wish to indulge you can buy them all from Mrs Snufflebean. You could make a whole blanket with 120 different combinations of 5 colours. There is a list of all the different combinations to help you here. Choosing colours for a project isn’t usually a challenge – and I can work with most of them. This project is probably the nearest I have come to a ‘scrap’ project. I have some yarns left over from previous projects and they are taking up space. They are from a mix of manufacturers, but are all double knitting. There is such a strange mix of yarns and colours, and ones that that I certainly wouldn’t normally have put together. 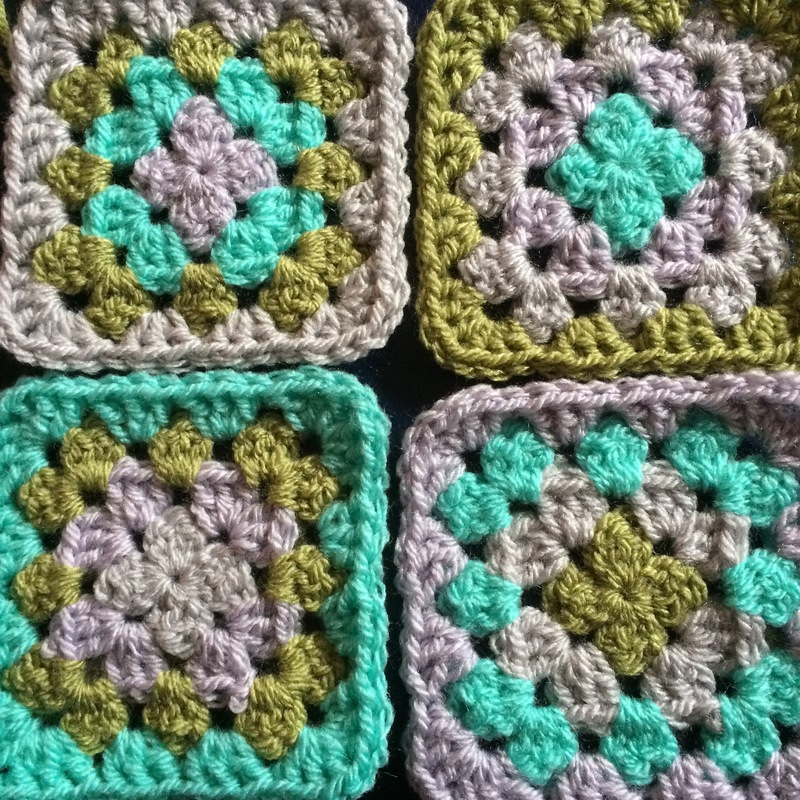 After due consideration i decided that Granny Squares would mix them up better than rows of pattern. The difficulty, though, was deciding on a colour to co-ordinate. I decided that I didn’t want to go for a neutral – black, grey, cream, white etc – this had to be a colour, but which one? And then I remembered something! You have probably never heard of Constance Howard. She died in 2000 having made a very big mark on Textile Art in the twentieth century. I was very blessed to have been able to meet her socially and also to take workshops with her at Masterclass level. She was inspirational. Maybe I will tell you more about her another time, but as far as this project is concerned she is the inspiration. Her tricks with colour were sensational, but there was one that she used par excellence. Her favourite colour was Turquoise, and she maintained that it was the colour to add when all else failed! So….. for the sake of constancy…. My joining colour is Turquoise!